We, at The Akshaya Patra Foundation strive towards providing mid-day meal to more than one million school children every day across India. A nutritious meal is prepared in our kitchens and is distributed in various Government schools. As a part of the employee engagement initiative, the Human Resource team of the Akshaya Patra arranged a school visit for the kitchen employees. This enterprise was taken up in order to weave a thread of connection between the kitchen staff and the school children. 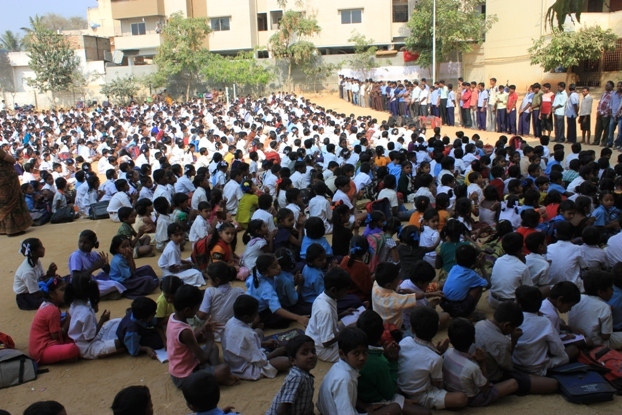 The employees visited the Government Higher Primary School Uttarahalli in Bangalore. The children assembled for their morning prayer after the bell rang. They were all curious to know, as to who were the people standing in front of them. The Principal announced that they were none other than the Akshaya Patra employees. The announcement was met with excited cheers and claps. The children were elated to meet the staff. When the Principal asked, whether the students would like to visit the centralised kitchen, there was a loud “YES” – the roar of 1000 enthusiastic children. There was an interactive session, during which the children were briefed about the nature of work of the kitchen employees. In their interaction the employees explained the importance of the mid-day meal to the children. As the employees and the children talked, there was applause, laughter, and a lot of smiles. The children also shared their thoughts on their favourite Akshaya Patra dish. The employees were glad to meet the children for whom they cook and they understood how their effort is making a huge difference in the lives of the children.